(Francisco Kjolseth | The Salt Lake Tribune) Salt Lake City International Airport announces food concessionaires for the first phase of the new expanded airport during a tour on Wed. Feb. 20, 2019, as renderings provide a visual snapshot of the food and beverage options that is said to include 23 concepts with a number of home-grown options that are local favorites. (Francisco Kjolseth | The Salt Lake Tribune) The Terminal Plaza towers above those gathered as Salt Lake City International Airport announces food concessionaires for the first phase of the new expanded airport during a tour on Wed. Feb. 20, 2019. (Francisco Kjolseth | The Salt Lake Tribune) Doug Hofeling, Chief Operating Officer for Salt Lake Brewing Company, joins the press announcement within the large Terminal Plaza at Salt Lake City International Airport where food concessionaires were announced for the first phase of the new expanded airport on Wed. Feb. 20, 2019. (Francisco Kjolseth | The Salt Lake Tribune) Jasen Asay, Public Relations Manager for Salt Lake City International Airport overlooks the map with Concourse A and B with the placement of new food concessionaires during a tour on Wed. Feb. 20, 2019. (Francisco Kjolseth | The Salt Lake Tribune) Salt Lake City International Airport announces food concessionaires for the first phase of the new expanded airport during a tour on Wed. Feb. 20, 2019, that is said to include 23 concepts that includes a number of home-grown options that are local favorites. (Francisco Kjolseth | The Salt Lake Tribune) Nina Madonia, Chief Executive Officer for The Grove, joins the press announcement within the large Terminal Plaza at Salt Lake City International Airport where food concessionaires were announced for the first phase of the new expanded airport on Wed. Feb. 20, 2019. (Francisco Kjolseth | The Salt Lake Tribune) Salt Lake City International Airport announces food concessionaires for the first phase of the new expanded airport during a tour on Wed. Feb. 20, 2019, as renderings provide a visual snapshot of the food and beverage options that is said to include 23 concepts with a number of home-grown options that are local favorites. (Francisco Kjolseth | The Salt Lake Tribune) Todd Smith, Chief Marketing Officer for Cafe Rio, joins the press announcement within the large Terminal Plaza at Salt Lake City International Airport where food concessionaires were announced for the first phase of the new expanded airport on Wed. Feb. 20, 2019. 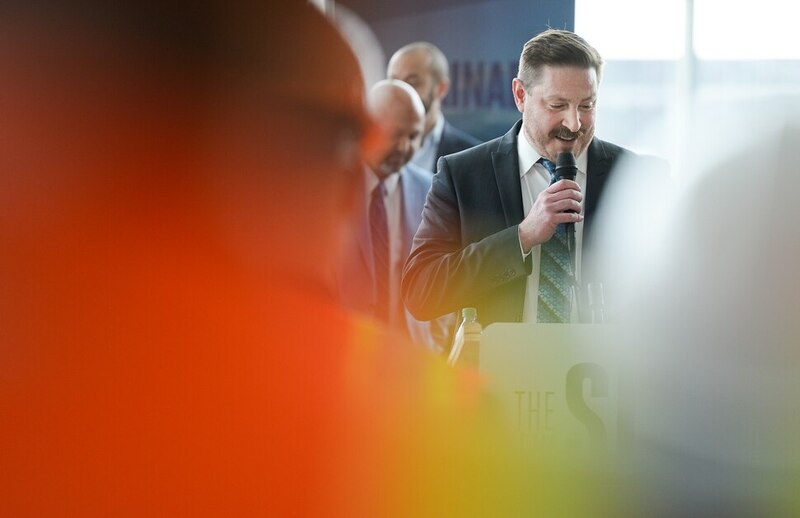 (Francisco Kjolseth | The Salt Lake Tribune) John Buckner, Director of Administration and Commercial Properties, joins the announcements by Salt Lake City International Airport for food concessionaires for the first phase of the new expanded airport during a tour on Wed. Feb. 20, 2019. (Francisco Kjolseth | The Salt Lake Tribune) People gather in the large Terminal Plaza of Concourse A, as Salt Lake City International Airport announces food concessionaires for the first phase of the new expanded airport during a tour on Wed. Feb. 20, 2019, that is said to include 23 concepts with a number of home-grown options that are local favorites. (Francisco Kjolseth | The Salt Lake Tribune) Salt Lake City International Airport announces food concessionaires for the first phase of the new expanded airport during a tour on Wed. Feb. 20, 2019, as renderings provide a visual snapshot of the food and beverage options that is said to include 23 concepts with a number of home-grown options that are local favorites. (Francisco Kjolseth | The Salt Lake Tribune) Work continues on the immense space of the Terminal Plaza as Salt Lake City International Airport announces food concessionaires for the first phase of the new expanded airport during a tour on Wed. Feb. 20, 2019, that is said to include 23 concepts with a number of home-grown options that are local favorites. (Francisco Kjolseth | The Salt Lake Tribune) What is scheduled to be known as The Canyon begins to take shape within Concourse A as Salt Lake City International Airport announces food concessionaires for the first phase of the new expanded airport during a tour on Wed. Feb. 20, 2019. (Francisco Kjolseth | The Salt Lake Tribune) Work continues on the immense space of the Terminal Plaza as Salt Lake City International Airport announces food concessionaires for the first phase of the new expanded airport during a tour on Wed. Feb. 20, 2019, that is said to include 23 concepts with a number of home-grown options that are local favorites. (Francisco Kjolseth | The Salt Lake Tribune) Salt Lake City International Airport announces food concessionaires for the first phase of the new expanded airport during a tour on Wed. Feb. 20, 2019, as renderings provide a visual snapshot of the food and beverage options that is said to include 23 concepts with a number of home-grown options that are local favorites. (Francisco Kjolseth | The Salt Lake Tribune) Doug Hofeling, Chief Operating Officer for Salt Lake Brewing Company, prepares for an interview with the media during a press announcement within the large Terminal Plaza at Salt Lake City International Airport where food concessionaires were announced for the first phase of the new expanded airport on Wed. Feb. 20, 2019. (Francisco Kjolseth | The Salt Lake Tribune) Salt Lake City International Airport announces food concessionaires for the first phase of the new expanded airport during a tour on Wed. Feb. 20, 2019, as renderings provide a visual snapshot of the food and beverage options that is said to include 23 concepts with a number of home-grown options that are local favorites. (Francisco Kjolseth | The Salt Lake Tribune) Work continues on the immense space of the Terminal Plaza as Salt Lake City International Airport announces food concessionaires for the first phase of the new expanded airport during a tour on Wed. Feb. 20, 2019, that is said to include 23 concepts with a number of home-grown options that are local favorites. (Francisco Kjolseth | The Salt Lake Tribune) Salt Lake City International Airport announces food concessionaires for the first phase of the new expanded airport during a tour on Wed. Feb. 20, 2019, as renderings provide a visual snapshot of the food and beverage options that is said to include 23 concepts with a number of home-grown options that are local favorites. (Francisco Kjolseth | The Salt Lake Tribune) Salt Lake City International Airport announces food concessionaires for the first phase of the new expanded airport during a tour on Wed. Feb. 20, 2019, that is said to include 23 concepts that includes a number of home-grown options that are local favorites. (Francisco Kjolseth | The Salt Lake Tribune) Salt Lake City International Airport announces food concessionaires for the first phase of the new expanded airport during a tour of the Terminal Plaza, at right, and part of Concourse A, on Wed. Feb. 20, 2019, that is said to include 23 concepts with a number of home-grown options that are local favorites. (Francisco Kjolseth | The Salt Lake Tribune) Work continues on Concourse A, as Salt Lake City International Airport announces food concessionaires for the first phase of the new expanded airport during a tour on Wed. Feb. 20, 2019. (Francisco Kjolseth | The Salt Lake Tribune) Salt Lake City International Airport announces food concessionaires for the first phase of the new expanded airport during a tour on Wed. Feb. 20, 2019, that is said to include 23 concepts that includes a number of home-grown options that are local favorites. (Francisco Kjolseth | The Salt Lake Tribune) Work continues on the immense space of the Terminal Plaza as Salt Lake City International Airport announces food concessionaires for the first phase of the new expanded airport during a tour on Wed. Feb. 20, 2019, that is said to include 23 concepts with a number of home-grown options that are local favorites. (Francisco Kjolseth | The Salt Lake Tribune) Salt Lake City International Airport announces food concessionaires for the first phase of the new expanded airport during a tour on Wed. Feb. 20, 2019, as renderings provide a visual snapshot of the food and beverage options that is said to include 23 concepts with a number of home-grown options that are local favorites. 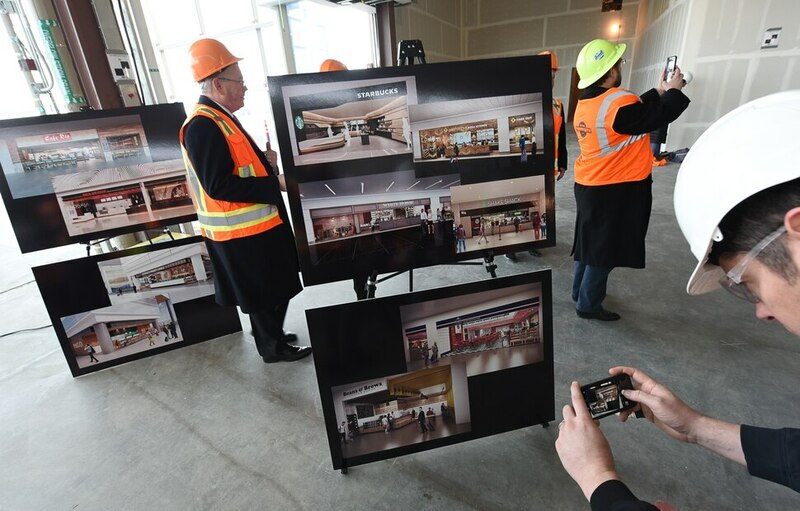 (Francisco Kjolseth | The Salt Lake Tribune) Crews work in Concourse A as Salt Lake City International Airport announces food concessionaires for the first phase of the new expanded airport during a tour on Wed. Feb. 20, 2019. (Francisco Kjolseth | The Salt Lake Tribune) Work continues on the immense space of the Terminal Plaza as Bill Wyatt, Executive Director of Salt Lake City International Airport, talks about the recently announces food concessionaires for the first phase of the new expanded airport during a tour on Wed. Feb. 20, 2019. (Francisco Kjolseth | The Salt Lake Tribune) What is scheduled to be known as The Canyon, to the left, begins to take shape within Concourse A as Salt Lake City International Airport announces food concessionaires for the first phase of the new expanded airport during a tour on Wed. Feb. 20, 2019. (Francisco Kjolseth | The Salt Lake Tribune) Salt Lake City International Airport announces food concessionaires for the first phase of the new expanded airport during a tour on Wed. Feb. 20, 2019, as renderings provide a visual snapshot of the food and beverage options that is said to include 23 concepts with a number of home-grown options that are local favorites. (Francisco Kjolseth | The Salt Lake Tribune) Salt Lake City International Airport announces food concessionaires for the first phase of the new expanded airport during a tour on Wed. Feb. 20, 2019, as renderings provide a visual snapshot of the food and beverage options that is said to include 23 concepts with a number of home-grown options that are local favorites. (Francisco Kjolseth | The Salt Lake Tribune) Salt Lake City International Airport announces food concessionaires for the first phase of the new expanded airport during a tour on Wed. Feb. 20, 2019, as renderings provide a visual snapshot of the food and beverage options that is said to include 23 concepts with a number of home-grown options that are local favorites. (Francisco Kjolseth | The Salt Lake Tribune) Salt Lake City International Airport announces food concessionaires for the first phase of the new expanded airport during a tour on Wed. Feb. 20, 2019, as renderings provide a visual snapshot of the food and beverage options that is said to include 23 concepts with a number of home-grown options that are local favorites. (Francisco Kjolseth | The Salt Lake Tribune) Work continues on the immense space of the Terminal Plaza as Salt Lake City International Airport announces food concessionaires for the first phase of the new expanded airport during a tour on Wed. Feb. 20, 2019, that is said to include 23 concepts with a number of home-grown options that are local favorites. (Francisco Kjolseth | The Salt Lake Tribune) Concourse B begins to take shape in the distance during a recent tour by Salt Lake City International Airport announcing food concessionaires for the new expanded airport on Wed. Feb. 20, 2019. (Francisco Kjolseth | The Salt Lake Tribune) Concourse B begins to take shape in the distance during a recent tour by Salt Lake City International Airport announcing food concessionaires for the new expanded airport on Wed. Feb. 20, 2019. (Francisco Kjolseth | The Salt Lake Tribune) Concourse B begins to take shape in the distance during a recent tour by Salt Lake City International Airport announcing food concessionaires for the new expanded airport on Wed. Feb. 20, 2019. Let the salivating begin: Salt Lake City International Airport announced Wednesday that it chose a mix of 23 local and national food concessionaires for its new terminal and concourses when its first phase of reconstruction opens late next year. The best part: They all agreed by contract not to hike up prices at the airport, but to charge the same as they do at other locations. So if a menu item costs $5 in downtown Salt Lake City, “at the airport it will be $5,” said John Buckner, the airport’s director of administration and commercial properties. Airport officials say the rebuilt airport will feature far more food and drink choices — from Asian to Italian, Mexican and American — than the space-constrained current airport, which was built to serve 10 million people but saw about 27 million pass through last year. Among locally based companies chosen are: Café Rio, Granatos, Market Street Grill, Squatters Pub, Uinta Brewing, Wasatch Pub, Blue Lemon, Beans & Brews and SLC Life Market/Creminelli Fine Meats. Others, including national chains, selected are: Bruges Belgian Bistro, California Pizza Kitchen, Fillings and Emulsions, Pago, Panda Express, Panera Bread, Pizzeria Limone, Pulp Lifestyle Kitchen, Shake Shack, Silver Diner, Starbucks, White Horse Spirits & Kitchen, Pick Up Stix and Smashburger. Some of the establishments — a Blue Lemon café and Starbucks — will be outside the security checkpoint for people waiting to greet passengers. Buckner said the airport sought to “create a diverse and vibrant concessions program … from fine dining to casual dining to coffee to retail to all kinds of specialty services” that the airport’s tight spaces did not previously allow. The first phase of the $3.6 billion airport rebuild will include a central terminal, the west end of two concourses and a parking garage. A second phase is scheduled for completion in late 2024 — and concessionaires for it will be chosen later. Some of the newly named concessionaires said they are excited by the new airport’s architecture, stunning views of mountains and the opportunities it offers them. Pat Murray, executive vice president of SSP America, said his umbrella company for food services operates in 200 airports around the world. In December, the airport announced a mix of 20 local and national news and gift stores that also will pack the rebuilt airport. By contract, those stores also will keep their airport prices as low as those found elsewhere in the city. Among local and regional merchants and services to be featured are Hip & Humble, Liberty Park Market, Maverik, Rocky Mountain Chocolate Factory, the King’s English, Visit Salt Lake, The Salt Lake Tribune, Deseret News and KSL-TV. Among the national and international brands are XpressSpa, iStore, Coach, CNBC, Frye and Tumi. The first phase of the airport rebuild will include 30,781 square feet of retail space — 23 percent more than the existing airport. Another 14,554 square feet are expected in the second phase of the project.